MTM On the Level Contracting wants to share with you some very exciting news that will save you money ! We are now offering Thermal Imaging services. Thermal imaging was introduced to most people while watching home repair shows like Holmes on Homes. Mr. Mike Holmes uses Thermal Imaging on his T.V. shows to graphically show issues such as heat loss, air infiltration, mold, moisture, roof leaks, and structural issues. 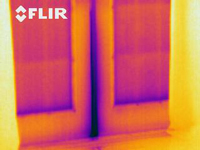 Thermal Imaging is very useful for electrical inspections or to find out if you have a pest problem such as rats, mice, wasps, or a bee’s nest. Thermal Imaging is done with a camera that only sees heat patterns and shows on-screen a color picture of objects that radiate heat. The different colors depict differences in temperature. Displayed in the image below you see the technician pointing out the cooler areas where, in this case, water had leaked through the buildings foundation, and gone under the subfloor in the basement. 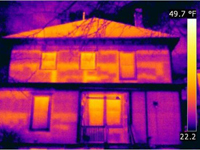 Heat loss patterns on the exterior of a home. So, how will this help save you money? Well, how would you like to be the poor couple who bought their house not knowing about the hidden water problem? With a proper Thermal Imaging scan the buyers would have known about the problems before they purchased. We can help save you money by providing accurate estimates for repairs. Recently a remediation company was called to give an estimate on the cost to remediate a townhouse that had experienced water ingress from the unit above. The remediation company handed the insurance company a quote for over $4000.00 to remove the ceiling, and part of the walls due to the estimators fear that the entire ceiling may be filled with mold. MTM On The Level Contracting was called in for a second opinion. We were able to determine that the affected area was very small and easily treatable. The problem was solved for $681.89. We were able to save this company over $3200.00 in charges, and save a huge headache for the homeowner. There are many other ways that our Thermal scans can save you money. If you are thinking of purchasing a house, or building, a Thermal scan will provide you with valuable information and enable you to make a more informed decision. If you already own a home or building, we can show you where you are experiencing heat loss that, if rectified would save money on your heating and cooling costs. 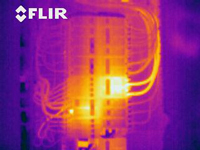 One of our most recent Thermal scans turned up a very serious problem with an electrical system that was about to cause a fire. 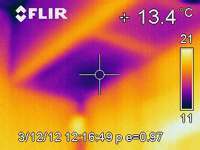 We were able to investigate and show the customer the heat marks on the wood frame of the wall. If you have aluminum wire in your building we strongly recommend a complete electrical system scan at least every two (2) years. MTM On The Level Contracting can save you money whether you own a home, are looking to buy a home, or you need a second opinion on a project. Overheated breakers due to undersized wiring and loose connections.